In the video below—which you can also watch on our YouTube channel—we parody John Lennon’s “Come Together” to celebrate the genius of Frank Lloyd Wright and the labor of the 100′s who volunteer at the Frank Lloyd Wright Preservation Trust. What fun! But mucho, mucho apologies to Mr. Lennon. Could a person who thought he was so right have a better name than Wright, or a better name to pun on? There’s the FLW Preservation Trust’s gift catalog “Buy Wright,” and their magazine “Wright Angles.” Want to take a local tour? 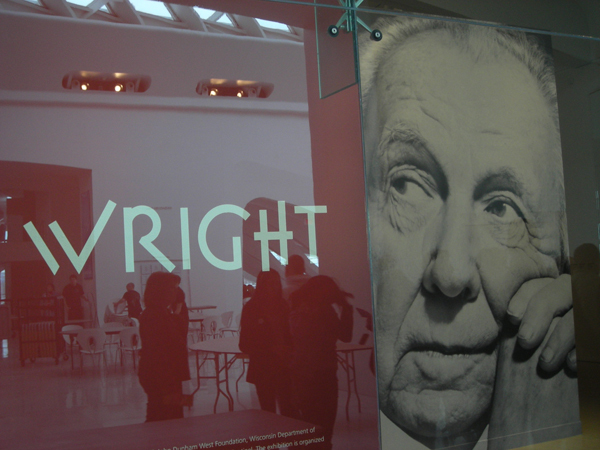 There’s one called “Wright Around Chicago.” You get the idea. So my wife Linda—who manages all those Trust volunteers—thought, Why not “Come Together Wright Now” as the theme for the 2013 Volunteer Appreciation Party? And why not a parody of Lennon’s song as the party’s centerpiece? Lots of things seemed to her to be coming together for the Frank Lloyd Wright Preservation Trust, including the recent addition of The Rookery, Bach House, and Unity Temple to their already-distinguished tour sites. (It’s managed Wright’s Home and Studio in Oak Park and Robie House in Hyde Park for decades.) She enlisted me and volunteer, artist, and blogger extraordinaire Jim Nedza to write the parody, wrote a few lines herself, and for the music she turned, of course, to Dan Guzman. We kept several Lennon lines because: Frank Lloyd Wright often wore a flat top hat, was infamous early on for long hair, and lived a life and created an art about freedom. He always seemed to be groovin’ one way or the other. We were working with two geniuses here. “Come Together” is one of my top-10 Beatles favorites, and its stature seems to rise for everyone as years go by. When you parody a great song you realize how really great it is, the genius of Lennon’s music and lyrics striking you harder each time you hear it. The song was about Timothy Leary. 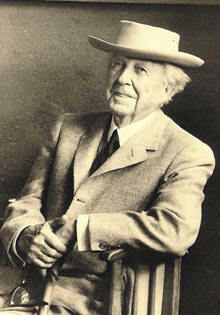 Frank Lloyd Wright’s egoism certainly rivaled Leary’s. The video above begins with one of many famous Wright pronouncements: “I’ve been accused of saying I was the greatest architect in the world, and if I had said so, I don’t think it would be very…arrogant.” He so firmly believed in his greatness, the greatness of his work, but that priceless pause, that slight smile, before the word “arrogant” hints that maybe he took his greatness with some grain of salt—as little, as miniscule, as that grain might have been. The history he made required far less ingestion than Leary’s, though we know many had to swallow a lot to deal with his thorny genius. History’s judgment of Frank Lloyd Wright’s work, however, seems to glow brighter and brighter. He got that Wright. Sorry. That couldn’t be helped. It just couldn’t. Whether we got it Wright (there it is again!) is another matter, but we hope you enjoy it. Pictures near video’s end are from the 2013 Volunteer Appreciation Party, an important Trust event for recognizing and building its volunteer community. See Jim Nedza’s DesignSlinger website on Chicago architecture. Hear more of Dan Guzman’s music. This entry was posted in Arts, Music & Media Podcasts and tagged Bach House, Dan Guzman, DesignSlinger, Frank Lloyd Wright, Frank Lloyd Wright Preservation Trust, Jim Nedza, John Lennon, Linda Guzman, Richard Guzman, The Rookery, Timothy Leary, Unity Temple. Bookmark the permalink. It was a great project to work on together. We certainly got that Wright right!